Annual preventative maintenance is vital to the health of your air conditioner. Air conditioners and HVAC systems have a number of parts which can be covered with dust, bacteria, pollen, chemicals and other particulates. That’s why air conditioning repair and maintenance is so important! When particulates gather on the coils and filters, your air conditioner’s efficiency can seriously drop, resulting in the unit using up to 40% more energy and providing 30% less cooling, costing you a bunch of money each month for a reduced benefit. In between professional cleanings, you can follow the below steps to troubleshoot any reduction in cooling power. Just be certain to completely disconnect the air conditioner from any power supply, and follow all safety instructions. If you don’t feel comfortable with air conditioning repair and maintenance, call the team at H&S anytime. If you feel like your air conditioner just can’t keep up with the heat, you may simply need to change the air filter. If you have regular maintenance set up with the H&S team, we’ll either have already taken care of this or be on our way to change it out for you. If you don’t, call us today to set up maintenance. Air filters should be replaced every 1-3 months for optimal air flow and energy efficiency. This helps your whole system cool better, and better prevents dust and allergens from circulating through your home. Another reason you might not be getting cool enough air is because your condenser coils are dirty. This is a harder operation to pull off, and if you don’t feel comfortable please call us. Also, please take all safety precautions when attempting this procedure – this is not a complete guide. 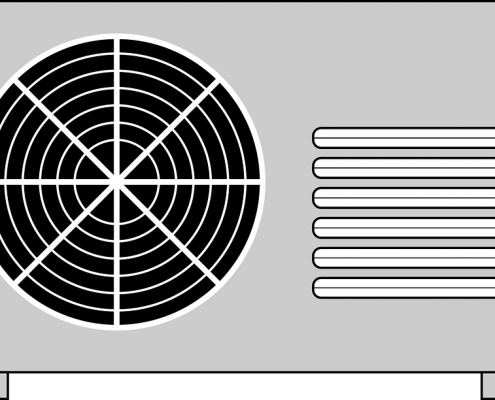 In order to access condenser coils you’ll need to completely shut off power to the air conditioner at the breaker, then turn off the power switch on the unit itself. Accidental electrocution is not a fun time. Next, you’ll need to remove the disconnect block and clean the condenser coils on the exterior unit. Even if they look clean, clean them, then clean them again. If the coils are clogged, they will run until the motor overheats and then shut off, which is how you get the intermittent cooling issue. Once you’ve reassembled the air conditioner, let it run for 30 minutes before testing the coldness level, and let it run for 24 hours before deciding if you’ve truly fixed the issue or not. If you’ve come home to find that your home is super hot, there is a chance the solution is simple – the breaker tripped. Be sure to check your breaker box and see if the circuit the air conditioner runs on is active. If it’s not, turn it completely off and back on again. If your system continues to trip the breaker, you’ll need to give us a call for expert air conditioning repair and maintenance. Worried About Radon? How H&S Can Help You Breath Easier. How Frequently Should I Change My A/C Air Filter?